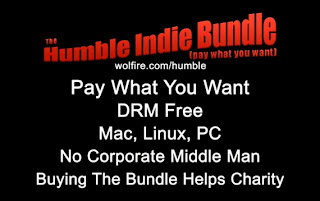 The Humble Indie Bundles (Humble Bundles) are a series of bundled DRM-free multi-platform games, that were sold at a 'pay what you want' price point. The proceeds are split between the indie developers, two gaming related charities (Child's Play and EFF) and Humble Inc, which pays for the bandwidth and development of the promotion. The first Humble Indie Bundle went on sale from May 4 through May 11, 2010 and included five games initially including: World of Goo, Aquaria and Gish. The bundle went on to achieve more than US$1 million in sales within the week from approximately 116,000 donations. The current bundle on offer is the Humble Voxatron Debut bundle which includes the alpha version of Voxatron, a 3D retro blended shooter and two other fantastic games: The Binding of Isaac and Blocks That Matter. Have you bought a humble indie bundle before? Up until now there have been six bundles including the Humble Voxatron Debut, though the numbering of some bundles appears odd, such as the Humble Indie Bundle #3 which was actually the fourth bundle to appear. The bundles have included some high profile games such as: Braid, Frozen Synapse, VVVVVV and World of Goo. These games had already become quite popular amongst gamers but they gave gamers, who may have planned on picking up the above games, more incentive to purchase the bundles. The rest of the games on the bundles were usually much less well known in gaming circles and so could stand to really benefit from the exposure of the Humble Bundles, usually resulting in significant increases in their userbases. The bundles have also given gamers a nice blend of different genres to play from platformers and action to tower defence and point 'n' click adventures. No bundle released so far has had less than three games to choose from by the end of the promotion, though often games are added on top of the original selection of games, as an incentive to donate at least the current average price point in order to receive these additional games. To entice gamers even more, the bundles include steam keys to let gamers redeem their purchase and download the steam version of the games which may include achievements, stat-tracking, steamplay etc. To date, all of the bundles have been a relative success. It was only the Humble Frozen Synapse bundle that did not reach $1 Million in sales by the end of it's promotion, though it still generated $700,000 which is fantastic. The Humble Bundle #3, which included VVVVVV and Crayon Physics Deluxe managed to generate an enormous $2.1 million by the end of it's promotion which was brilliant news for the charities and developers alike. So far they've amassed over $7 Million in sales from these fantastic bundles. These amazing figures have given the charity, Child's play, thousands of dollars to spend on: new consoles, peripherals, games, and more for hospitals and therapy facilities. Allowing for children to enjoy age-appropriate entertainment, interact with their peers, friends, and family, and can provide vital distraction from an otherwise generally unpleasant experience and aid recovery. As well as kept indie developers on a stable income to help create more exciting games. Love the idea of paying what you want as often pay for games that are not quite as you expect. Quite happy to pay for good games, for me and my boys, and love to think that some of the proceeds are going to charities for kids not so fortunate as my own.